Are you shopping for stylish and durable flooring that is also practical and budget-friendly? Do you love the charming appeal of wood, stone, or ceramic flooring, but don’t have the budget you need? Then you are in luck. Our flooring store is proud to provide you with a large collection of luxury vinyl tile. This high-quality resilient flooring option is not only durable and affordable, but it can be designed to expertly mimic the look and feel of the wood, natural stone, or ceramic tile flooring. Our luxury vinyl floor tile allows you to create the look you want for your bathroom, kitchen, or home without the fear of scuffs, scrapes or stains. Give your family and guests something stunning to stand on. Available in many varieties and colors, LVT caters to anyone’s design preferences. Why settle for worn-out flooring when we provide a more appealing option? Unlike vinyl flooring from years ago, LVT is durable and – most importantly – appealing. At our luxury vinyl tile store, we carry premium products that are unmatched in resilience and beauty. If you want the high-end look of hardwood, check out our selections of luxury vinyl plank flooring that comes in a variety of species, complete with grain patterns and whorls. We sell and install a variety of different LVT flooring options that are sure to meet your style demands. Our showroom boasts an array of colors, designs, and styles that allow you to choose the LVT floors that best suit your budget and aesthetic preferences. In addition to guiding you through the selection process, we also offer professional luxury vinyl tile installation from experienced and skilled installers. 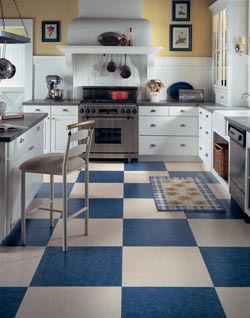 Do your part to help the environment by purchasing luxury vinyl tile. The biggest difference between older vinyl and luxury sheet vinyl is its eco-friendliness. Not only did some traditional vinyl use asbestos in production, but the process for creating it was wasteful. Modern vinyl flooring takes advantage of technology and manufacturing that makes it “greener” than ever. Other ecofriendly resilient flooring materials such as cork, linoleum, and rubber are also available for special applications. If you are a family with children or pets, you know that it just makes fiscal sense to have a strong, durable floor installed that can withstand the wear and tear that comes with an active household. This doesn’t mean you have to give up the stunning style of pricier flooring options. We carry designs and styles from all of the brands you know and trust to ensure you are able to have a floor installed that not only looks great, but can last long and look great for many years to come. By incorporating new technology, flooring manufacturers create luxury vinyl floors that emulate the styles, patterns, and colors of wood or ceramic. In fact, their amazing depth and realism will fool even your most observant guests. Allow our sales professionals to help you choose the ideal flooring for your next project. We’ll effectively give your entire home an upgrade with vinyl floors that look just like wood plank flooring. Best of all, these floors will not warp. They are moisture resistant and practically impervious to temperature changes. Choose the style and price you want. Our luxury vinyl plank flooring is manufactured to look like a wide variety of wood species. Whatever you choose, your new floor will add rich character to your property. Homeowners from across our service area realize how beneficial it is to have luxury vinyl floor tile or planks installed into their homes. These impressive flooring options are able to meet both your aesthetic and functional goals. With our vast selection available, you can create the eye-catching look you want at a fair price and with little upkeep. How are these floors able to provide so much? It all has to do with how they are made. This flooring is constructed in multiple layers, including a resin, a protective top layer, and a design layer. These layers come together to create a flooring option that can also be designed with beautiful patterns that emulate the look of ceramic, wood, or stone flooring. That means you can enjoy the look you want with the easy maintenance you need. While heavy foot traffic, stains, and spills can compromise the integrity of other surfaces, LVT and LVP are engineered with durability in mind. Make sure you are getting the best of both worlds by selecting luxury vinyl plank flooring or tile for your home. When you want a floor that perfectly emulates hard wood, stone, or ceramic flooring at a very affordable cost, we have exactly what you need. Furthermore, when installed by our professional luxury vinyl tile installation team, you are able to enjoy a floor that looks the way it’s supposed to look and lasts long. The result is a floor with a high-end appearance that can be easily maintained using a damp cloth or mop and manufacturer-recommended solutions. You are saving a lot of money, time, and frustration by choosing these floors for your home, and you can reap these benefits when you have a trained professional install the floors for you. Many times an amateur installer can make a small or large error that can come back and ruin the integrity of your flooring system, costing you extra money in the end. By using our team, you can rest easy knowing that everything is installed the right way the very first time. Our certified contractors have the skills and experience to properly install your new luxury vinyl floor tile. When you install a new floor, you want it to last for years. Fortunately, our resilient flooring is more durable than ever. These top-quality, yet affordable, vinyl floors hold up under many years of wear. Just as the name suggests, resilient flooring is truly resilient! They are perfect for busy households and businesses. Most importantly, these floors offer stunning beauty and impressive performance. If you are in search of new floors that withstand heavy foot traffic and add more ambiance to your space, this is the perfect option for you. Your new floor needs a strong and level surface. To ensure you have long-lasting, quality floors, it’s vital to accurately prepare the surface. That’s why our professional installers take special care to do everything right. We use a team that is skilled at ensuring your new floor is clean and level before installation. You’ll be impressed with the finished product for many years to come. Contact us to schedule a free room measure when you want a new LVT floor. We proudly serve customers throughout Jackson, WY, as well as the surrounding areas.